What were those architects thinking? Melbourne boasts plenty of geometric designs in both public art and buildings. Some can be spotted a mile off, but some of the truly mesmerising attractions are little-known. The Pixel Building in Carlton is Australia's first, and so far only, carbon neutral office tower. The coloured panels actually serve a purpose, optimising the indoor light levels and minimising glare. Designed by studio505, the building received the highest ever awarded Green Star rating of 105 - a perfect 100 plus an extra five points for innovation. It may have been named one of the top ten ugly buildings in the world, but what could be unappealing about a burst of colour? Like all good architecture, it is divisive - you either love it or hate it. Back in 1978, Yellow Peril was considered more of a joke than art. Image: Wikimedia Commons. Try to get your money's worth out of the abstract sculpture Vault, or Yellow Peril as it has affectionately come to be known. 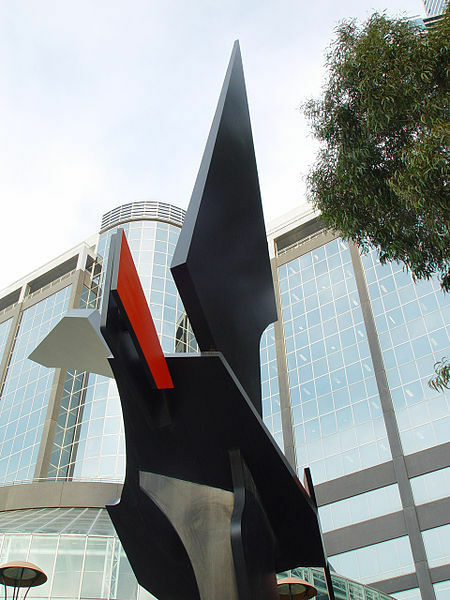 This piece of rate-payer funded art cost $70,000 when it was commissioned in 1978. 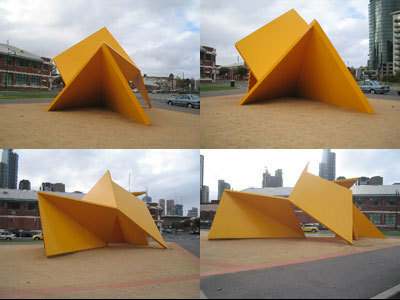 Created by sculptor Ron Robertson-Swann, Yellow Peril is made from steel painted a garish shade of yellow. Throughout its troubled lifetime, it has enjoyed several different locations in Melbourne's city. Starting out in City Square, it was then neglectfully maintained in Batman Park for many years. 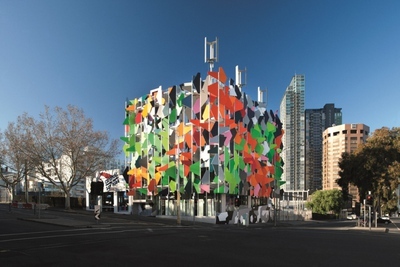 It is now found outside the Australian Centre for Contemporary Art, where it fits in perfectly with the geometric architecture. Port 1010 at Digital Harbour. Image: Wikimedia Commons. 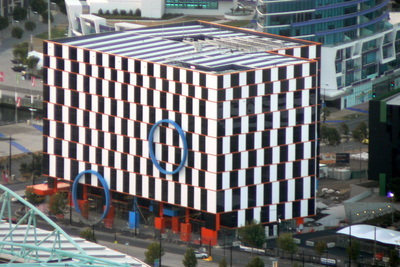 Port 1010 in the Digital Harbour precinct of the Docklands is an energy efficient building with a Green Star rating of five. Its modernist design closely resembles the cafe wall illusion, where straight horizontal rows of alternating black and white blocks appear to be sloped. The facade of the nine-storey building adds to its energy efficiency due to its low thermal conductivity. Theoretical Matter at Heide Sculpture Park. Who would have thought that some steel rods welded together could provide such a visual feast? Theoretical Matter, made by Neil Taylor, has no discernable meaning or purpose, but is totally captivating. You'll want to look at it from every angle. Find it at Heide Sculpture Park in Bulleen. RMIT Building 22 is a much despised mass of green blobs and triangles. 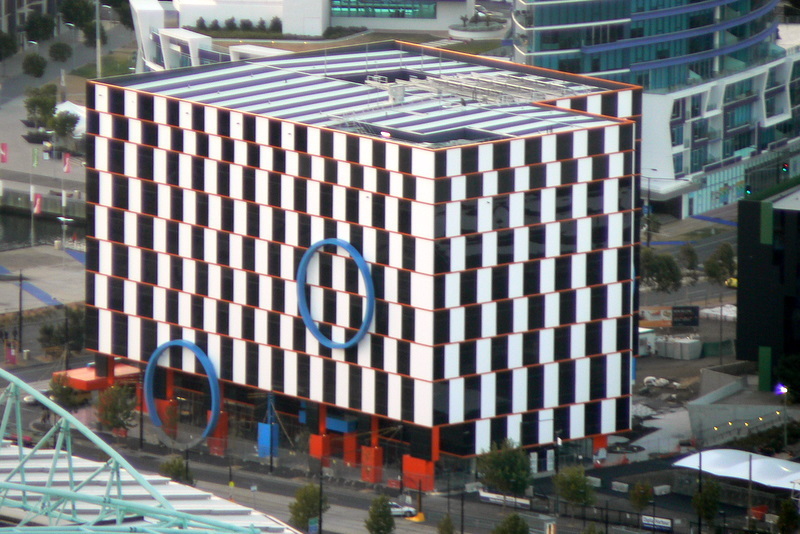 Image: RMIT University. It's only fitting that a leading architecture university hires one of their own graduates to liven up the place. 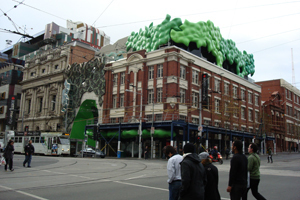 RMIT Building 22, located on Swanston Street, has been nicknamed 'green brain' (or if you prefer, 'lower intestine') since its five and a half million dollar makeover in 2007. 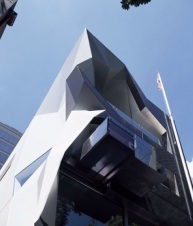 A private office building in the CBD, the striking geometric architecture of Monaco House has made it a talking point despite the limited public access. Designed by McBride Charles Ryan, the award-winning deconstructivist building is hidden away in tiny laneway Ridgway Place. There is a small cafe, Liaison Cafe, on the ground floor. Inge King's Shearwater. Image: Robin Whittle. Shearwater, by prominent Australian scuptor Inge King, is a steel creation of a shearwater bird. 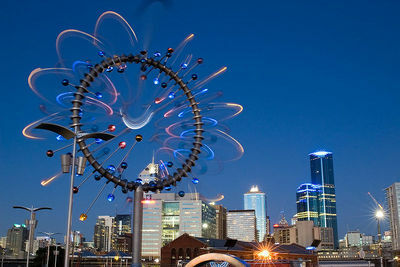 The larger-than-life sculpture can be found at Southbank, not far from another of her impressive sculptures, Forward Surge. This long exposure photo of Blowhole shows the movement of the armature and cups. Image: Wikimedia Commons. 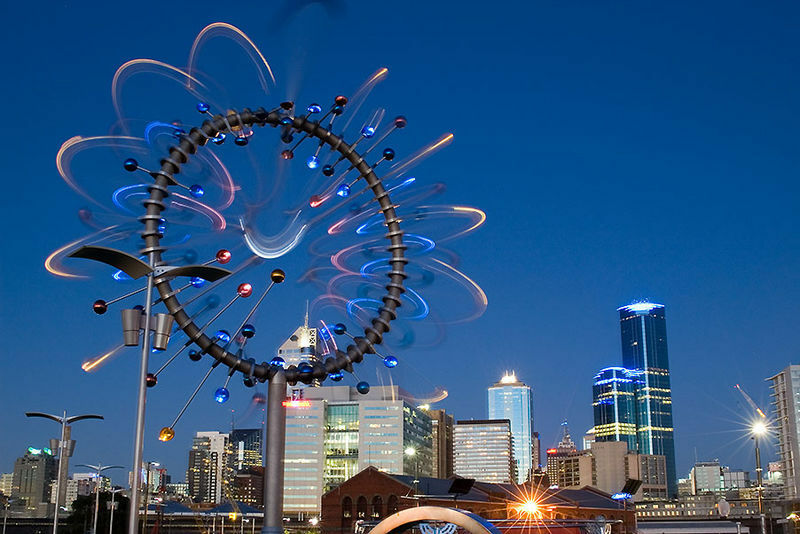 Blowhole is a dynamic wind-powered sculpture at Docklands Park. The fifteen metre high structure and its cacophony of orange and blue wind-catching cups somehow managed to cost $700,000. There is meant to be some sort of symbolic meaning attached to the mesmerising aluminium and steel creation, although how it relates is a mystery to me. Webb Bridge in Melbourne's Docklands. Image: Donald Y. Tong. Not far from Blowhole is the curious Webb Bridge. The award-winning bridge links the north and south sides of the Docklands and has provision for both cyclists and pedestrians. 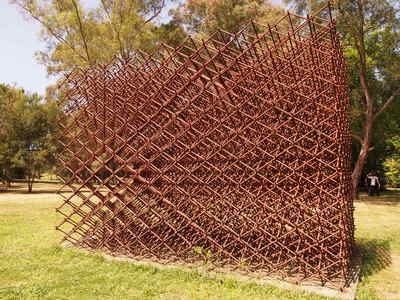 The lattice design supposedly represents Koori fishing traps and baskets. The Arts Centre spire is a disctinctive feature of Melbourne's city. Image: Wikimedia Commons. An iconic Melbourne structure, the Arts Centre spire is 162 metres tall and has 6600 metres of fire optic tubing to create a variety of lighting schemes. In a nod to the Arts Centre's cultural significance, the base of the spire is designed to resemble a ballerina's tutu. The most interesting thing to ever happen to the spire was when it was accidentally set ablaze by the New Year's Eve fireworks to bring in 2012. A panoramic view of Federation Square. Image: Wikimedia Commons. You can't talk about geometric structures in Melbourne without mentioning Fed Square. Famed for its ugliness, Federation Square forms the cultural and community centre of our city. It has repeatedly ranked in top ten lists of ugliest buildings in the world and even resulted in the architects receiving a barrage of hate mail shortly after its completion in 2002. Costing $450 million, much of which was government funded, it's worth seeing just so you can appreciate where your taxes go. It apparently "utilises new understandings of surface geometries" in the creation of its triangle-dominated facade. Why? Because some of these structures have artistic merit. Thanks for a great article!!! I love architecture that pushes boundaries. I have seen some of the featured sculptures and buildings around, but some of the others that you mentioned, I'm going to have to seek them out.